Have you ever noticed that the food packaged for small animals targets a specific species? That’s because the diet required for small pets is very diverse. It is important to get the right nutrients for each type of pet to ensure that they are getting everything they need to thrive. The diet for a Guinea pig is drastically different than what you might feed a mouse, although there can be similarities. When it comes to Guinea pig care and feeding or taking care of other small rodents as pets, your best bet is to visit your local Dartmouth vet hospital for some sound advice. Regardless of the size of your pet, it is essential that you make sure to provide clean, fresh water 24 hours a day, irrespective of the time of year. While we might feel more thirsty in the summer, pets require fresh water in spring, fall, and winter, just as much as they do in the summertime. This is the top requirement for all small pets. Their water should be changed daily at the very least and should be in a special water bottle with a sipper tube. Do not put a bowl of water in your pet’s enclosure. This can be easily contaminated with bacteria, food, urine, and feces. The water bottle method is best. The “top three” small animals kept as pets in the United States are hamsters, gerbils, and mice. Keeping small rodents as pets can be a challenge, but it doesn’t have to be. Take time to study their needs for everything from habitat to nutrition, and you will be very successful with these popular pets. Hamsters, gerbils, and mice and omnivores, which means that they can eat veggies and meat. A combination of these foods can be found in many packaged diet options at your local pet store or online. Grains and seeds are often sold with a mix of dried insects, vegetables, and fruits. These animals are known for hoarding and storing food, which is why it is important to stay on top of the amount of food that you are providing to avoid under or overfeeding. One tablespoon of mix per day is the average. Make sure to feed small animals at the same time every day. It will help you remember and keep them on a feeding schedule. Any treats that you provide should be a very small portion of their daily diet. Extra vitamin supplements and fresh foods can also be given when needed. Avoid raw potatoes and beans, chocolate, tomatoes, and iceberg lettuce. Too many greens can cause diarrhea, and sticky foods can be dangerous to all rodents. If your pet eats something they shouldn’t, bring them to our Dartmouth vet hospital right away. Another very popular rodent is the Guinea pig. Unlike hamsters, gerbils, and mice, Guinea pigs are herbivores, which means that they only eat green foods. 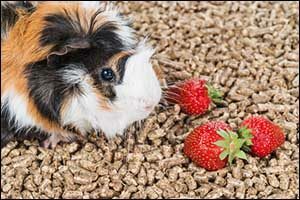 A pellet diet can be a great success for Guinea pigs and their owners, along with a combination of grass hay and dark, leafy greens that include collard greens, dandelion greens, and kale. Larger than the other small rodents as pets, Guinea pigs require approximately 1/8 of a cup of pellets per day for the average adult pet, along with the required greens. Treats can consist of fresh fruits, including bananas, apples, cherries, grapes, oranges, strawberries, and pears. Additional Vitamin C can be required for most Guinea pigs, and it is available in drop form to be added to their water supply. They require 10-30 mg per day. Much of this can come from feeding treats; however, a balance is needed to ensure that you are not overfeeding your Guinea pig. Avoid foods that are stringy, such as long celery stalks, and stay away from iceberg lettuce, due to its lack of nutritional value and high nitrates. Rhubarb and raw beans are also poisonous to Guinea pigs and should be avoided at all costs. If you suspect your Guinea pig may have eaten something that it shouldn’t, bring it to our animal hospital in Dartmouth for a check-up. If you have small “pocket” pets in the South Coast area, you should consider bringing them in for a veterinary check-up at Anchor Animal Hospital in Dartmouth. While we do provide vet care for cats and dogs, we also provide care for small rodents, including hamsters, gerbils, Guinea pigs, and rabbits. If you have another type of pet, contact our office directly to see if we have a specialized veterinarian who can provide you with the level of care that your pet requires. Call us at 508-996-3731 to schedule an appointment or speak with a team member.